Today is the Day 3 of our January Release Reveals! Are you enjoying the new products so far? 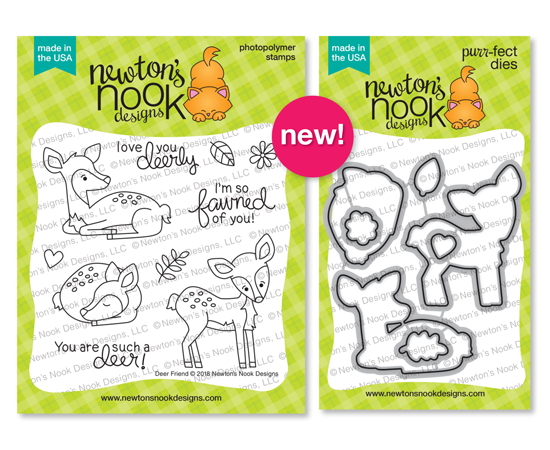 Today we have some more cuteness with our adorable new Deer Friend Stamp Set and Coordinating Die Set. We are giving the Deer Friend stamp set away one lucky winner so make sure you read all the way to the bottom of this post to see how to win! This sweet little 4x4 stamp set includes a three adorable fawns and will be perfect for sending cards to all those who are "deer" to you! 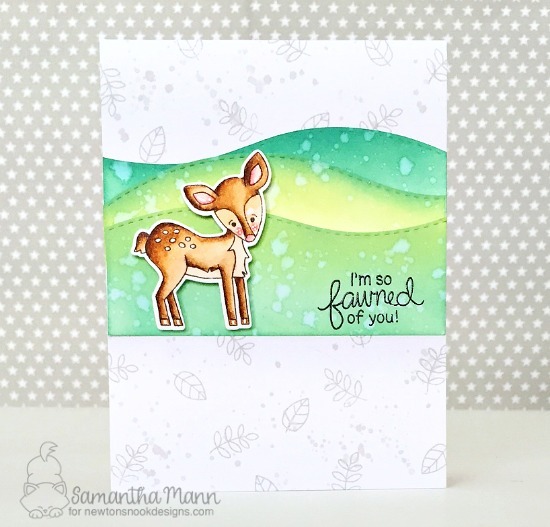 The adorable deer themed sentiments pair perfectly with the images. Use the included flower, leaves and gift for making fun nature background patterns too! Get ready for cuteness overload as our Design Team features some deer inspiration! 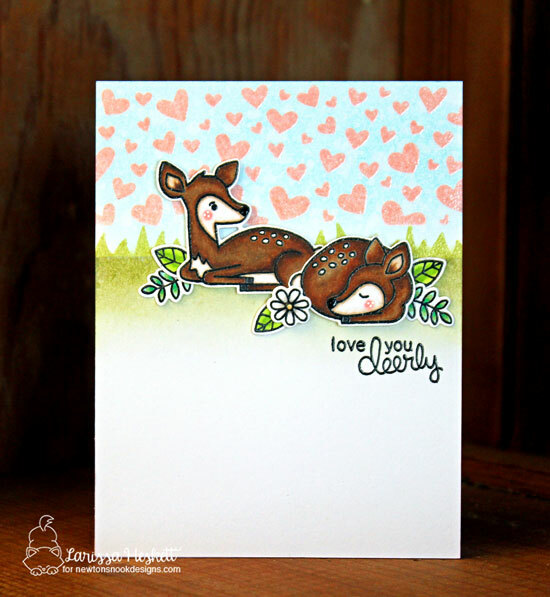 This sweet fawn card by Juliana would be perfect for Valentine's Day. She used two of the fawns from the new Deer Friend Stamp Set along with the big heart from the Darling Hearts Die Set. She also used our Frames & Flags Die Set to create the stitched edge frames. This little square card by Jennifer is so charming! The cute deer, leaves and flowers from the Deer Friend Stamp Set really pop over the layers of white cardstock and vellum! Larissa created this darling little scene with the two fawns resting in the grass! She used the fawns, flowers and leaves from the Deer Friend Stamp Set and nestled them over grass created with the Land Borders Die Set. She also used the Tumbling Hearts Stencil to create the heard background. This beautiful hilly scene was created by Samantha! She used the fawn from the Deer Friend Stamp Set and layered him over hills cut out using the Land Borders Die Set. She also used the the little leaves from the new Deer Friend Stamp Set to create a subtle background pattern! The two fawns on this card by Naki look so cozy snuggled in together! She layered them over a gorgeous inked background oval and added bits of grass using the Land Borders Die Set. She also added in a couple of flowers from the Deer Friend Stamp Set for a lovely finishing touch!! This card by Holly is so darling! She created an cozy winter scene for the fawn by stamping trees from our Whispering Pines Stamp Set behind the fawn! She also used our Frames & Flags Die Set to create the scallop edged frame on the xo xo paper and banner for the sentiment. Ellen created this sweet scene using two of the deer from the Deer Friend Stamp Set in front of a woodsy background setting. The pink edges make coordinate so perfectly with the pretty pink sky and are perfect for a special Valentine! 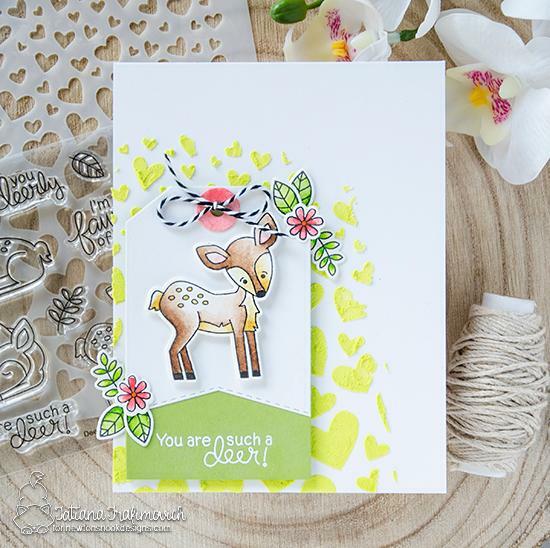 Tatiana created this cheerful spring card featuring the fawn from the Deer Friend Stamp Set. She created a tag for the fawn using the Fancy Edges Tags Die Set and embellished it with the tiny flowers and leaves from the Deer Friend Stamp Set. She also used the Tumbling Hearts Stencil to make that fun lime green heart background! This woodland scene by Maria has so much fun dimension! 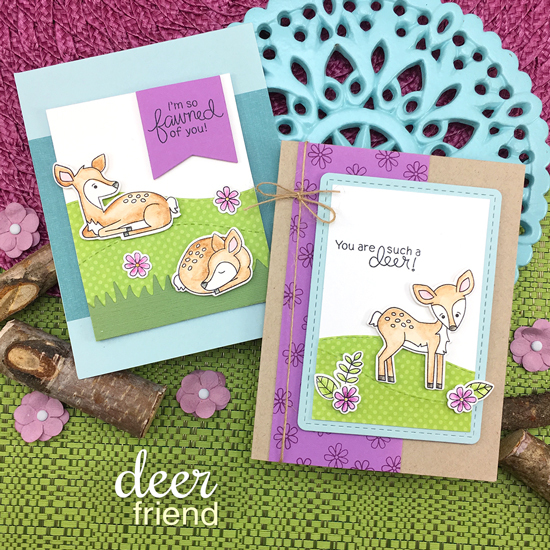 She nestled the two fawns from the new Deer Friend Stamp Set into this adorable scene with layers of grass using the Land Borders Die Set. She also added that cute pink bow on top using the Pines & Holly Die Set. Such sweetness in this new set! Looking forward to visiting the DT blogs and seeing more! What a sweet and cute set! Love how the design team interpreted it! Everybody came with so different, but fabulous projects!!! So much fun and inspiration!!! oh this is super cute stamp set! love all inspiration projects from team! Oh I just LOVE this set. Those deer are just the best. Thank you! These deer are so sweet! They are sooo sweet and adorable!! Absolutely adorable inspiration! This Deer Friend stamp set is a must have, it's so cute. Jennifer!!! Your cards are amazing. I love it! Such a very sweet set! Your cards are lovely, Jennifer. Very cute images and great sentiments. These deer are so sweet! I love them! These samples are too cute. Off to see the details. This has to be my favorite one! These deer are just to cute to not have! I cant wait to get this and try it out! I just love what the design team has done! They have out done themselves again! Love these sweet deer and the sentiments. OMG just when I thought nothing could get cuter then the little darling animal, clever, die cut outs you had on day two, here you go doing it again! Do precious. Want, want, need! These are the sweetest! Love the sentiments too! The Design Team has been rocking these reveals! AWWWWW! I LOVE this sweet little fawn and all the different poses and expressions she has in this set! I like how you created such dimension and texture with the use of different patterned papers and dies to create landscaping for him in your pretty cards Jen! I squeaked when I saw these. (That's a good thing, in case that wasn't clear.) We have deer all over the place here in Colorado where I live, so this set is perfect for me. I love the sweet fawns and just want to give them a hug! Thanks for more great ideas and sneak peeks! Oh my cuteness... this stamp set is so awesome. Love the punny sentiments too. This stamp set is adorable. Thanks for sharing. Love all the deer cards! Oh deer.... these are darling! I have so many great uses and ideas for this. 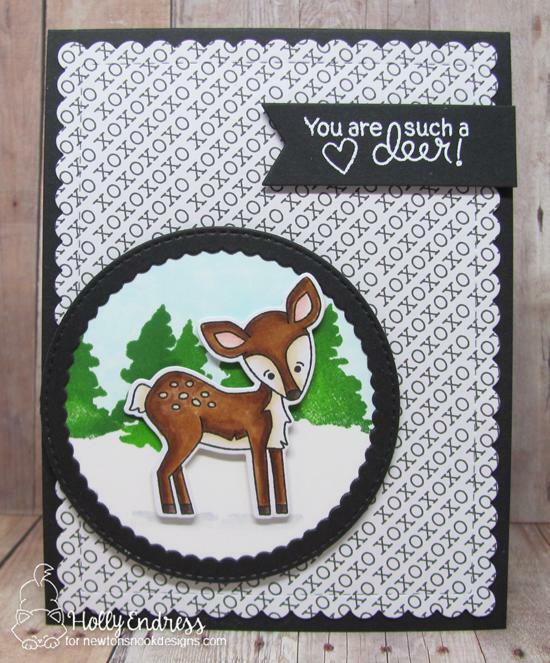 Beautiful cards made with the Deer Friend Stamp Set and Coordinating Die Set. Your cards are soooo adorable, Jen! Love the purple, green and blue color combo! The deer stamps are precious - this release is AWESOME! I just finished the hop and your designers have outdone themselves again! LOVE the deer! Fun to see all the different coloring variations too! Delightful cards! This is a precious set! Beautiful projects from the design team. These deer are absolutely adorable. A must have for me. I DEER-ly love this sweet set! These are super sweet dear! I love your cards. Love Love Love this set! The deer are so cute and have such sweet expressions on thier faces. The DT did an awesome job showcasing this set. Love all the creativity! I love these deer! What a great stamp set! These deers are absolutely precious ! I adore this set, every single DT project is like WOW! So incredibly sweet!